Know how to communicate. Know what the signals mean. Here are the basic crane signals our operators are trained to work with. If you would like a copy to print for your team download one of the PDF files A3 or A4 below. Sling and Communicate. Ideally all persons directing a crane require NZQA 3789. 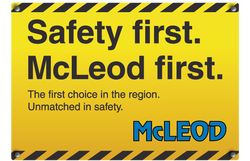 McLeod Cranes use dedicated RT Channels for all crane operations. These are crane control channels purchased by McLeod Cranes from Radio Spectrum Management.